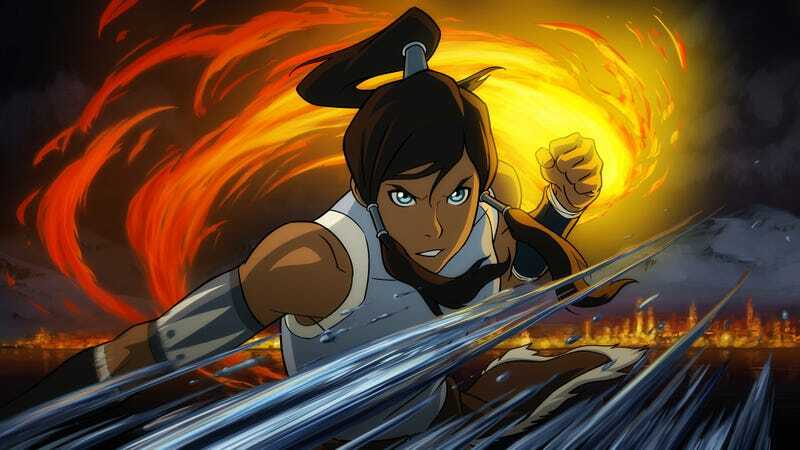 Didya watch the trailer for the second season of The Legend of Korra? Pretty good, right? Here's something less dramatic: a small clip that shows us where Korra, Bolin, Mako and Asami are in book two—straight from Nickelodeon. Legend Of Korra: "Rebel Spirit Sneak Peek"
DiMartino clarified the love interest situation: "Korra and Mako are now together," he said. "They both have these really important jobs. He’s a cop, she’s the Avatar — and things can get a little complicated. They’re in these respectable positions, and they're trying to maintain this relationship. Then we have one of the most bizarre love stories for Bolin, which I don’t want to give away. In Avatar, we have plenty of relationship stuff going on — love triangles and stuff like that — but I think the ones we deal with in Book Two, we’ve never done before. They’re different dynamics." Nick also has a bunch of art from book two, if you wanna take a look here. Otherwise, you'll have to sit tight until September to watch the new book. Side note: Korra, Mako may be more attractive but there's nothing interesting about him in comparison to Bolin. HMMPH.